This rally should continue due to multi-decade lows in unemployment and strong economic growth. I feel dumb. Really, really dumb. Why? Because I disagree with two of the smartest guys on the planet — Mike Larson and Sean Brodrick — about the direction of the stock market. I have to give both of them a lot of credit. They clearly and loudly warned their followers that the stock market was headed lower well ahead of the fourth-quarter meltdown. People that listened to them probably collectively saved millions, if not tens of millions, of dollars. Those were two of the best market-timing calls in all of 2018. Me? I stayed invested and recommended the same. That was painful advice in the fourth quarter of 2018, but has been very lucrative so far in 2019. Through the first four weeks of 2019, the S&P 500 is up 6.3% and the Nasdaq is up 7.2%. No question, those are powerful moves in a short period of time. In fact, Lakos-Bujas believes that massive buyback pressure combined with our still growing economy will send the S&P 500 to 3,000 by the end of the year. The members of the S&P 500 are scheduled to repurchase $800 billion of their own shares this year, per Dubravko Lakos-Bujas, JPMorgan's chief U.S. equity strategist. That's more than a 13% gain from current prices! And for icing on the cake, S&P 500 companies will shell out another $500 billion in dividends in 2019. Consider this: When my brilliant friends Mike and Sean correctly warned about the stock market's fall, the Federal Reserve was in rate-hiking mode and the trade war tensions between the U.S. and China were getting worse. The exact opposite is true today. Jerome Powell and his Fed buddies have suddenly turned dovish and U.S.-China trade relations have been improving. Take a look at the jobs market, too. The national unemployment rate is only 3.9% and initial jobless claims just hit a 49-year low of 199,000 last week. When you factor in population growth over the last five decades, the decline is almost jaw-dropping. 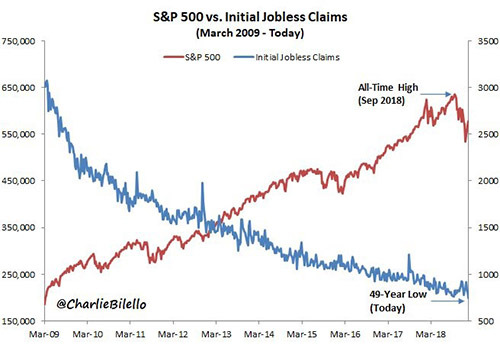 And as the accompanying chart shows, there has been a strong inverse correlation between jobless claims and the S&P 500. My advice: Stay invested.Sure, the government shutdown will cause an upward blip in January, but that's temporary. The jobs market is strong, vibrant and growing. Which tells me that the current rally is far from finished as the stock market plays "catch up" with the jobs market. Maybe you think I'm nuts. Hey, I've been called much worse. But if you think stock market trouble is brewing, I highly, highly recommend that you take a look at Mike's Safe Money Report and Sean's Supercycle Investor. They are two of the best in the business at managing risk and making money while everybody else is losing their shirts. Sean's cycles research produces not just helpful, but extremely accurate, timing information. This cycles research has also helped call every major move in the gold market since 1999. I'll let Sean tell you all about it, along with four fortunes you can start taking your claim in as soon as today, here.